daptics is available for low-complexity experiments free of charge, with full functionality. This offer holds for factorial experiments that have up to 4 numeric parameters, with up to 8 values each. Beyond the free zone, daptics has unique, cost-efficient, pay-as-you-go approach to pricing. We do not require costly ongoing subscriptions, and instead enable users to pay for use of daptics, generation by generation. Pricing below is cited in terms of daptics credits, purchased on our website after signing up and logging in. Currently daptics credits may be purchased at $1 per credit. daptics pricing is dynamic, in that it depends on the complexity of your experimental campaign, as given by the experimental space definition (ESD). Some details of dynamic pricing are given below. Prices start out at less than 100 daptics credits per generation for relatively simple ESDs. An example ESD costing about 100 daptics credits per generation has 6 experimental parameters with 4 possible values each. Our web interface to daptics hits a maximal experimental complexity when ESDs reach 20 parameters with 20 values each, and when the population size reaches 2500 experiments per generation. daptics can be configured to handle larger ESDs and population sizes; please contact our sales team to discuss pricing for such special projects. If you sign up with a promotion code, you will receive 1000 free daptics credits for evaluation purposes. Please contact our sales team to receive a promotion code, or if you need additional credits to complete your evaluation. After the free promotional daptics credits are exhausted, you may purchase more credits via credit or debit card. Substantial discounts are available for purchasing daptics credits in bulk. Site licenses with an annual subscription are also available. Please inquire with our sales team. Substantial discounts are available for academic research, especially student projects. Please inquire with our sales team. For large academic projects, it should be possible to incorporate expenses for daptics into grant budgets. Usage of daptics is priced to reflect the complexity of your project, and in particular the size of your experimental space, resulting from the number of experimental parameters and the number of values per parameter. The price also varies with the number of experiments performed per generation, but this variation is far weaker. 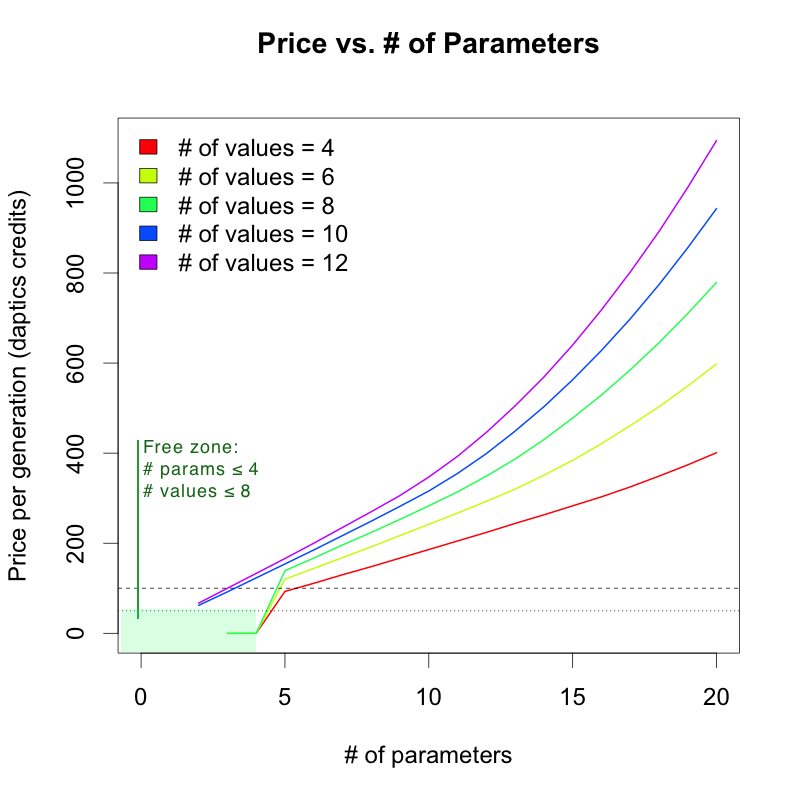 The graph below illustrates how the price per generation varies as a function of the number of experimental parameters, for a range of number of values per parameter, assuming 100 experiments per generation, and a factorial experimental space. After you specify the ESD for a new experimental campaign, the price per generation (in daptics credits) will be shown to you in the left sidebar. This amount will be debited from your account each time daptics designs a new generation. Proceeding to the design of the first generation will indicate your acceptance of this price.